There are still lots of ways to find a great looking cheap beach wedding invitation without it looking cheap and there are so many designs to choose from. You can find traditional, modern and even the unusual with invitations sent as messages in a bottle or attached to the side of a bucket and spade. 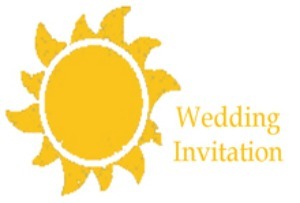 It helps if you are organized and if your beach wedding is during the popular summer vacation months it is a good idea to send your wedding invitations sooner than the norm of at least 10 weeks in advance, with 12 weeks being better. You can also opt for a save the date card on top of the Beach wedding invitations to ensure that all the important guests will be able to attend your wedding. Just remember that save the date cards are an added expense. Save yourself money by sending your invitations out sooner then you won't need the save the date cards. The cheapest beach wedding invitations will be the ones that come in kits, choose the kit that has enough invitations with a few extra and spares in case some of the printing goes a bit wrong. You just know that it will if you don't have a few spares! 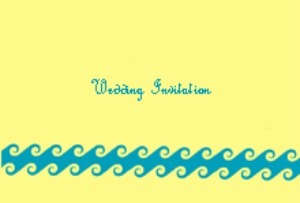 Here are some lovely beach wedding invitation kits that are available at the moment online. Also, have a look at the online printing stores ones that don't just concentrate on wedding invitations. 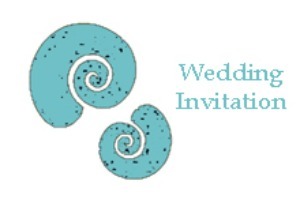 Have a look for designs that have a beach theme, they may not be listed as wedding invitations but you can change the wording inside the invitations and get a great invitation for much less. 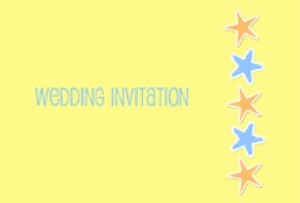 Basic Invites is one of our favorites for the design and color choice, plus they also have fantastic invites for less than $1. You could also have a look at making your own cheap beach wedding invitation, just keep an eye on your costs as craft stores have an amazing way of making you spend more than you need, or is that just me?! Cost out your diy beach wedding invitations, just as you would if you were buying the bespoke invitations. Sometimes it can be cheaper to buy them. 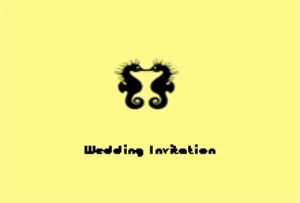 One way to make your beach invitations is to use rubber stamps, popular designs you can buy are shells, seahorses and starfish. Or you can look at designing your own with computer graphic programs. Here are some that I have put together for you. 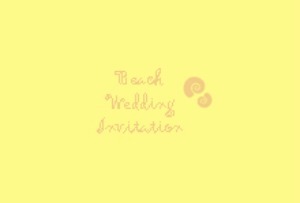 Just click on the picture that you like and a pdf of the beach wedding invitation will be there for you to print for free. You can't get cheaper than that!